Join us for an afternoon of healthy fun, games and exercise for all ages. 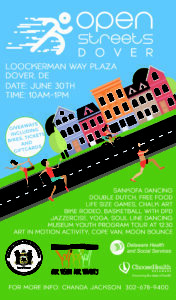 There will be activities on the corners of Cecil Street and Governors Avenue and Mary Street and Governors Avenue. Activities include Zumba, soul line dancing, bike rodeo, 5k color walk/run, community gardening, face painting, yoga, basketball and many more!